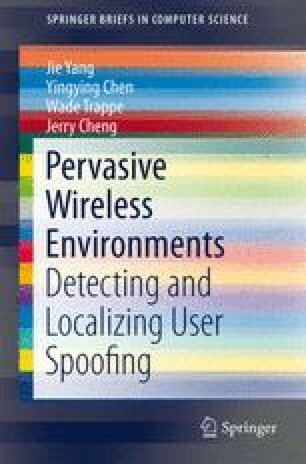 User spoofing has a serious impact to the normal operation of wireless and sensor networks. It is thus desirable to detect the presence of identity-based attacks and eliminate them from the network. The traditional approach to address identity-based attacks is to apply cryptographic authentication. However, authentication requires additional infrastructural overhead and computational power associated with distributing, and maintaining cryptographic keys. Due to the limited power and resources available to the wireless devices and sensor nodes, it is not always possible to deploy authentication. In this chapter, we take a different approach by using the physical properties associated with wireless transmissions to detect identity-based attacks. Specifically, we utilizes the Received Signal Strength (RSS) measured across a set of landmarks (i.e., reference points with known locations) to perform detection of identity-based attacks. In this chapter, we focus on static nodes, which are common for most identity-based attacks scenarios (Sheng et al., Detecting 802.11 MAC layer spoofing using received signal strength, in Proceedings of the IEEE International Conference on Computer Communications (INFOCOM), April 2008). Our scheme does not add any overhead to the wireless devices and sensor nodes.